Based on the conceptual work which was done in the previous steps, different solutions for the on farm biogas project could be identified and the feasibility assessment has also examine the economic, environmental and social aspects. With this preliminary work and the feedback of the supporting expert, the farmer has to choose the most feasible concept for his situation in the long term and write a business plan. The farmer has to decide which biogas solution is the most promising one – and which concept will be realized. 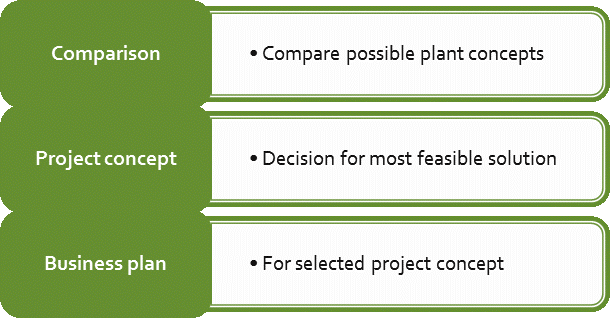 This project developing step is the most important and difficult to do, as it contains the final decision on the biogas plant project concept detailing each aspect of the selected project. The business plan will allow the farmer to present his on-farm biogas project efficiently, especially to authorities and banks. The farmer and the expert will make comparisons between the different concepts and plant solutions by evaluating the pros and cons of each of them. They are related to technical aspects, environmental, economic and social conditions, the role of the farmer and expected bottlenecks. The comparison can be carried out with the help of a SWOT analysis. It is an important part of the business plan. The strengths and weaknesses analysis is used for systematic observation of products, processes, enterprises and other objects to be analysed. The analysis can easily and relatively quickly identify existing problems and show opportunities of the project. “Strengths”: What strengths are characteristic for the project? “Weaknesses”: Are there any weaknesses which have to be taken into account? “Opportunities”: Which special opportunities are offered by project realization? ”Threats” of a project: Are there any threats, especially from the economic, legal or technical point of view? An exemplary overview of a SWOT-Analysis for a biogas plant project can be seen above. In the first step of the SWOT analysis, the four areas are to be filled with content. The internal influences are factors, which can be influenced by the farmer or person / institution that belongs to the project. Opportunities and threats, however, describe the business environment. Thus could be, for example, new markets or increasing heating costs. Threats may be, for example, political developments or declining demand. The external influences are factors, that can`t be influenced by the farmer or person / institution that belongs to the project. The strengths can e.g. be market positions or successful / useful products. The weaknesses can be, e.g. inefficient processes or upcoming dependencies. The gathering and analysis of own strengths and weaknesses return the internal point of view. The analysis start ideally with the aspects strength and weakness – this involves an objective consideration of the project. Subsequently trends of the respective strengths and weaknesses are created which determine whether the particular trend can be used as an opportunity or pose a risk for the project. With the strengths / weaknesses profile and the resulting opportunities and risks, an essential element of the business plan is developed. The farmer, supported by the expert, has to make a decision on the biogas project concept he wants to realize on his farm. 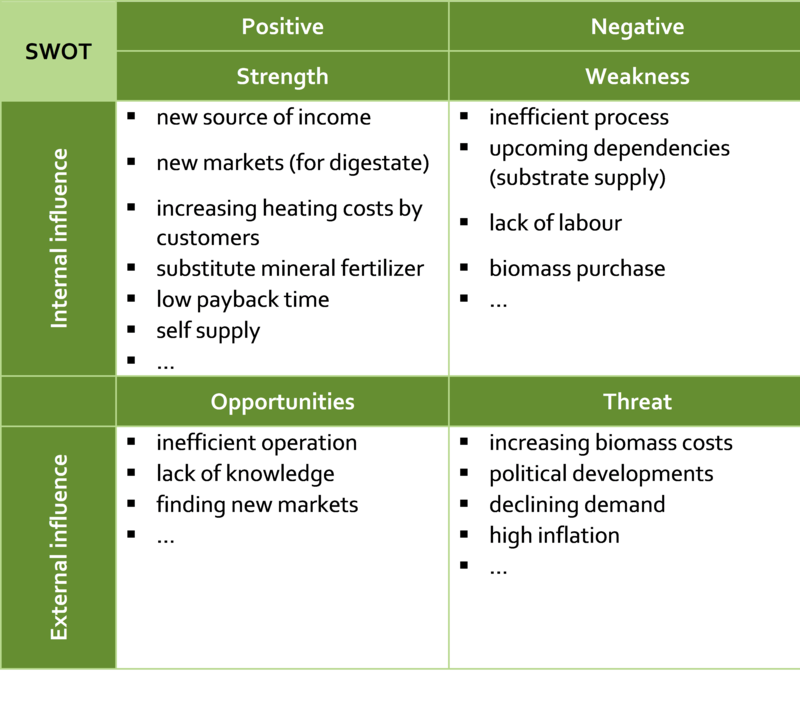 The decision will be based on the SWOT analysis results but also on e.g. financial or personal preferences. The elaboration of the business plan will be the following step of the concept development. The business plan is prepared and formulated to summarise the project idea and the new agricultural branch operation. The business plan describes in detail how this would work for the project, to whom it is directed, where the opportunities and risks lie and whether the project is worth it. It serves not only the future plant operators but is an important decision document for banks, authorities and possibly for business partners. The business plan will sum up all the details of the selected project concept. It refers to all the details elaborated within “the feasibility assessment study”. 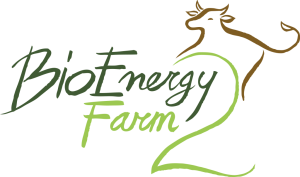 additional explanations by the bioenergy farm expert. it is also an informative document for banks or lenders, potential funding bodies and/or investors. Funding bodies will demand for such a business plan, but also for business partners it is an important document and guideline during the implementation of the project and for operating the new branch of the farm. In a well-written business plan, the critical points of the project are discussed and checked. As a result, the project stands before the realization on solid ground which prevents risks by planning deficiencies.